In this tumultuous political climate, it seems that people are more willing to wear their politics on their sleeve – quite literally. Pre-Brexit, people donned “Baby It’s Cold Outside” and Wolfgang Tillmans-designed tees to support the Remain campaign and, since the Referendum, people have been wearing safety pins to show solidarity against racism. The world of streetwear, it seems, has not been exempt from this new wave of political dressing. 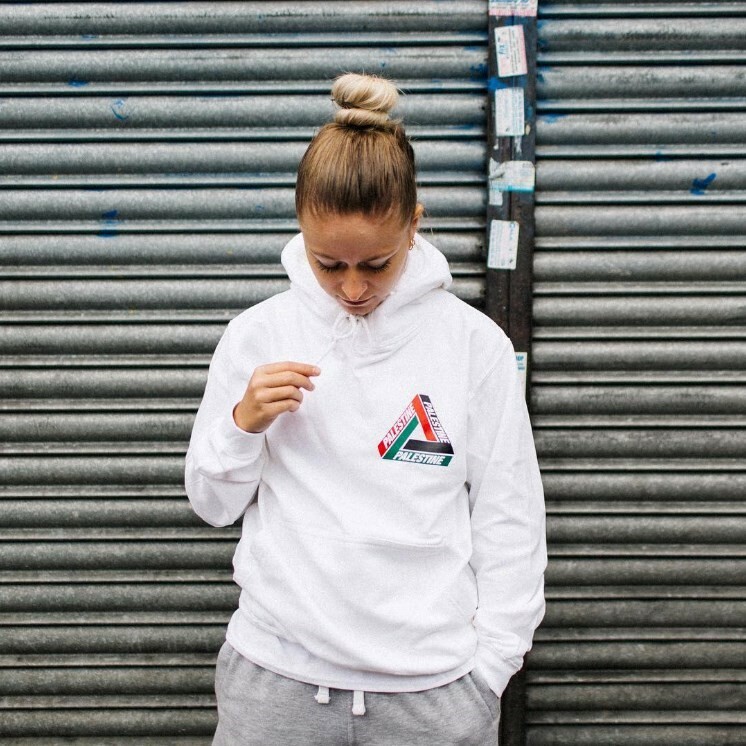 New bootleg brand HypePeace has been selling t-shirts, sweaters and hoodies emblazoned with a pro-Palestine riff on Palace’s infamous Penrose triangle logo. These designs, which have been seen on the likes of photographer Vicky Grout, grime MC Novelist and DJ Crack Stevens aka Akinola Davies JR, are being sold to raise money for charity. One of the longest conflicts in modern history, the dispute between Israel and Palestine has been going on for over half a century and left many Palestinians without human rights. The proceeds of HypePeace’s clothing are being donated to Sharek Youth Forum, an organisation helping young people in Palestine. While its creators are choosing to remain anonymous – simply referring to themselves as M and J – here, they discuss their label’s origins and why this is such an important cause. M: It all started with the design of the print. A simple epiphany I had, which was firstly integrated in a poster. The triangle hanging over Jerusalem’s skyline is still featured on our web shop and Instagram. The following step towards printing it on tops was an obvious one, so J got some samples done and went from there. We decided to donate the profit to a Palestinian charity once we started selling. This then became the main motivation to take the project further. J: Wanting to do something more with the things we both enjoy, sharing achievements with others and contributing to positive change along the way seems more relevant to us. At first I wasn’t keen on the idea of becoming another streetwear brand, but it’s important to do something more than just creating for the sake of it. M: Then the philosophy of spreading a more substantial message through the clothes we’d sell inspired me to come up with the name HypePeace. Where did the idea to integrate the Palace logo come from? J: The similarities between the word Palace and Palestine are equally obvious. Whenever M read the word Palace he simultaneously thought of Palestine. The link was always there. But the real strength of the design lies in the philosophy behind it. There’s a new generation of politically engaged people, who are unapologetically expressing their solidarity with the oppressed. Blatantly expressing this through what they wear, without compromising when it comes to style. It’s rejecting the cliché that we’re this superficial, egocentric ‘selfie’ generation that only follows the stream and upholds the status quo. J: The response has been wonderful! We never expected such a positive and supportive reaction, many people have reached out to us to show their support. To know that Palestine is still known and not forgotten is somewhat an achievement. I’m glad it’s back on the agenda. We’ve received one (very) angry email, which we’ve replied to with words of love and compassion, but it’s a shame the person blocked us so they never received the love they so deserve! M: Obviously there will always be people disagreeing but we all should instigate a healthy civilised debate, it’s part of HypePeace’s goal. J: Sometimes it is hard not to be frustrated or angered. It takes a lot of self control to maintain inner peace but we all have to, that's the most important thing. Have you heard what Palace think about it all? M: No we haven’t, but it would be interesting to see what they think. What do you think about Palace itself? M: I’ve always been a great admirer of the brand. They’ve released a few very wavy items and I’ve always been a fan of their VHS skate videos. J: We respect them. I’m not a fanatic, I don’t own any Palace pieces. But I do respect their business sense and direction. They are a cool bunch of guys and have really gone far with the brand and that’s to be commended. J: PrinzPi has been spotted (wearing them) and 40 recently purchased. Everyone who has supported us so far has been pretty cool. We even had a whole family ordering our garms. How did you get Novelist to wear one? M: I met Novelist backstage in Manchester at Warehouse Project. He knows my mate (DJ) Akito with whom I was out that night. I knew Novelist is politically engaged, asked him if he liked the project and the sweater I was wearing and if he’d like to have one sent to him. He gave me his address and a few days later we shipped it and so grateful he’s pushed it out there. All other people found us organically and contributed their support by ordering from us. Can you tell us a bit about the charity proceeds are being donated to? M: The Sharek Youth Forum is an organisation that promotes the development of youth through a plethora of innovative programs and workshops. It is a platform that allows young people to be creative, while simultaneously building capacity through self-development and helping the community. Sharek’s programs include arts and education training, work with children, and a newly established legal unit that will bring its activities to the next phase, ensuring that the rights of young people are complied with and lobbied at a legislative level, while developing acute political awareness and democratic principles among Palestine’s youth. People aren’t just wearing a tshirt, they are representing the rights of young people in Palestine. J: We plan to visit Sharek mid next year and see how it goes from there. We are also involved in a few things in relation to the cause and plan to do future collaborations with other NGO’s and charitable organisations but for now we’re focusing on Palestine. And if anyone wants to get involved and collaborate with us they are most welcome to get in touch.